Health Care Fieldwork in South Africa Through the U.Va. Field School for Public Health Research, Julie Sklar '18 was able to work with a medical anthropologist and epidemiologist in South Africa this summer. 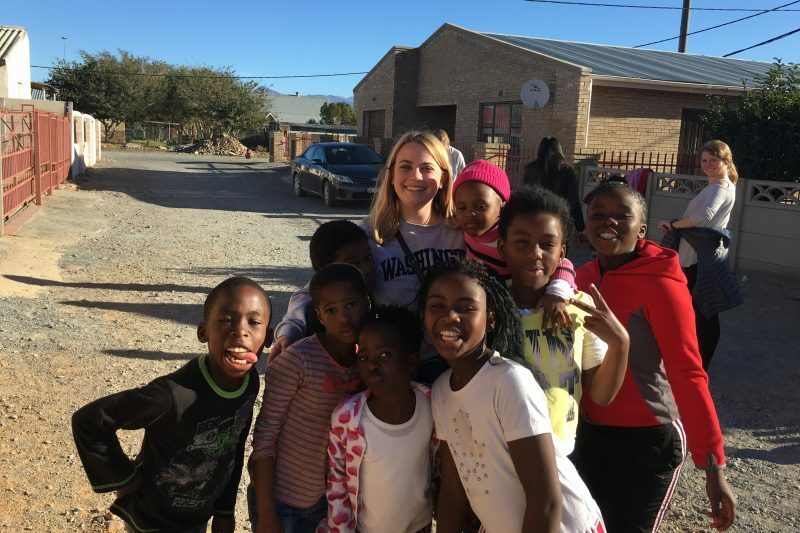 Julie Sklar poses with a group of children in South Africa, where she conducted public health research during summer 2017. Q: Tell us a little bit about your summer opportunity. I attended the University of Virginia Field School for Public Health Research in South Africa and worked with Dr. Christopher Colvin, a medical anthropologist and epidemiologist. The program provided an in-depth and mentored experience in public health research. While in South Africa, I was enrolled in two courses: one that focused on research methodology and the other a practicum in which I completed research in the field with five other students. In South Africa, I conducted my fieldwork in Khayelitsha, which is the largest township in South Africa. Within Khayelitsha, I researched residents of Town Two (a specific area of Khayelitsha) who lived with Type 2 diabetes and hypertension. As there are many organizations focusing on HIV/AIDS and tuberculosis in the area, my research group was interested in focusing on Type 2 diabetes and hypertension, diseases in that area that are not often discussed. The culmination of our research was a 45-minute presentation at the town hall, in which we invited all of our research participants, as well as community members, to attend. My time in South Africa was made possible through funding from the Leyburn Scholars Fund and a Johnson Opportunity Grant. Q: What has been your favorite aspect of your summer abroad? Cape Town provides an incredible place to study and further my study of sociology and anthropology, as it is a city of ethnic, racial, and socioeconomic diversity. Cape Town tells a complex story between the rich and the poor, as some people in Cape Town suffer from malnutrition and the paralyzing epidemic of HIV, while others have access to state-of-the-art biomedicine. These discrepancies make Cape Town one of the most fascinating places in the world to study public health. Additionally, while I was stationed in Cape Town, I had the opportunity to travel to Zweletemba, a largely rural township that faces its own social and health challenges. Every morning I traveled from Cape Town, where I was living, to the township of Khayelitsha, about a 30-minute bus ride. I began each morning with a Xhosa language class, which is an African click language that is spoken throughout the Western Cape. After class, most of the day was spent conducting research. That involved spending time in the local store trying to grasp prices of produce to interviewing a life-orientation teacher at the local secondary school to interviewing people living with Type 2 diabetes and hypertension about their lived experience with the disease and asking them to keep a photo diary of the food they ate. Q: What has been the most rewarding and fulfilling part of your experience? My favorite part of the program was my three-day homestay in the rural township of Zweletemba. During that time, I had no formal plans, which allowed me to truly immerse myself in my surroundings. My time in Zweletemba contrasted my time in Cape Town, a fast-paced, worldly city. The language component was undoubtedly the most challenging. The mother tongue of those living in Khayelitsha is Xhosa. And while some people spoke English, it was crucial to learn the basics of the Xhosa language to be able to communicate on a daily basis. The Xhosa language is an intricate African language that incorporates clicks on the letters x, c, and q. While I was only in South Africa for a short period, knowing the basics of the language proved essential, especially when asking people to open up about the most intimate and emotional details about living with a chronic illness. In Cape Town, I had the opportunity to work and study under Dr. Christopher Colvin, a medical anthropologist and epidemiologist whose research interests include HIV/AIDS, anti-retroviral treatment and masculinity; psychological trauma and storytelling; and community mobilization and health activism. During the research process, my group was assigned a field guide who was a respected member of the area, who helped introduce us to the local culture and research participants, as well assisting us with translation. Additionally, there were four research mentors each with graduate degrees in public health, who provided feedback throughout the research process. Last semester, I had the opportunity to take Medical Anthropology with Professor Harvey Markowitz, a class that challenged me to think how we could integrate Western medicine into non-Western communities, saving lives while promoting and preserving cultural diversity. In Cape Town, I was able to better understand the complexity that underlies the blanket terms of “health” and “wellness,” as good health is multidimensional and is composed of biological, psychological, political, environmental, and social and cultural factors. While I have begun to learn how these factors intersect in a given society in my anthropology classes, having field experience monumentally deepened my understanding. Additionally, one of my favorite classes I have taken at W&L is Professor Novack’s Deviance course. In the field, I appreciated my background in this area, as certain medical diagnosis come with social stigma. This experience further cemented my interest in the field of public health. I plan to pursue a master’s in public health. Washington and Lee has provided me a strong liberal arts background and has given me exposure to many different disciplines. However, having the opportunity to experience in real life the concepts and theories I have read and discussed in class has brought my understanding to the next level. My summer experience certainly demonstrated that the most rewarding moments come from venturing out of your comfort zone.